Having now given my forum the 'partial facelift' and uploaded the silver buttons you kindly made for me, I have changed the forum colours from blue and red to silver/dark red - which means that the bright blue in the existing banner no longer matches the forum. Could you please take a look at the forum, skouliki and see what colour would now look good in the banner? I don't think the dark red would look good as it would look drab - so instead of the blue/white circles, how about white/silver or silver/white? What do you think would look good there? Or maybe just one circle instead of two? 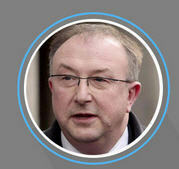 I think Colin Sutton's white circle looks slightly thicker than the others. Also, I really like the new grey avatar for 'offline', but could you make the same colour for 'online'? As I thought, the dark red looks drab up there, how about silver and white? But the banner is dark grey...wouldn't the silver show up against dark grey? At the moment we've got blue and white - so instead of the very dark red, could it be made a bit lighter? And instead of two red circles, keep one as white. Dr Vernon Coleman I think. Sorry for the extra work skouliki but if you're making it from scratch at least you'll have the correct banner on file. I've uploaded it...see what you think. i think its nicer ..
i wonder if i make the banner smaller ..smaller but the text i will keep it as it is...and you delete the code you have in your css about the banner ..will the forum look better? We could try, but I don't know where to find the code! If anything it would need to be shorter rather than narrower. I can't see anything in the CSS code about the banner, so it must be somewhere else. I don't know how to fix that either! And the CSS in the test forum is completely blank. i could make it smaller we can the text is still huge ..
You could, but then we might be going back into blurry text territory. I've uploaded it...the text is still huge. it is clear though ..should i make it smaller as a test?